Within the middle of the huge subscription box boom is one person with a single website, MySubscriptionAddiction.com. Started from an obsession of subscription boxes, it’s become the single largest affiliate for almost all subscription boxes today. And, because their editors create so many unboxing videos, get feedback from followers and see what works from a sales promotion perspective, MySubscriptionAddiction.com is the perfect place to learn what’s working in subscription marketing today. Liz Cadman, founder of MySubscriptionAddiction.com, is one of the best sources for insight into success in the subscription economy. MySubscriptionAddiction.com provides reviews and a directory of subscription boxes. They publish unboxing experiences and feature customer reviews to a growing and eager audience of subscription box enthusiasts. Her website currently averages a million visitors a month, with over 10 million pages viewed each month. MySubscriptionAddition.com followers are the most informed and motivated subscription buyers today. According to Liz, the average viewer of her website is 95% female, in the age range of 25 to 34, who has subscribed to at least 2 or 3 boxes at any given time, and spends at least $100 per month on boxes. And this average viewer has about seven more boxes on her wishlist too. And even though the MySubscriptionAddition.com audience is mostly women, they are still the top affiliate for a lot of the boxes that are targeting men. Women are the primary buyers for all subscription boxes, whether the box targets men or women. With such an immense amount of data on boxes and their customers, Liz is positioned to share valuable and proven tips for those wanting to enter the subscription economy. For starters, when considering the price point of your box, she recommends going for a higher price point, around $39-$49, as opposed to starting off with a low-price box. If you are looking for ideas and inspiration to create your own subscription box or grow your own membership program, Liz recommends studying Rachel Zoe Box of Style, FabFitFun, PopSugar Must Have, Loot Crate, Culture Fly, and Ispy. 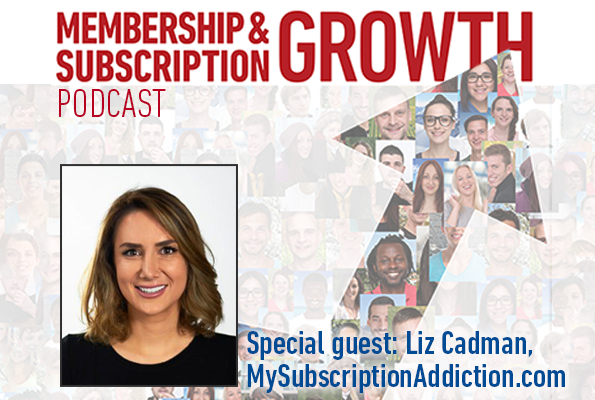 Discover more insights from Liz and her followers of MySubscriptionAddiction.com by listening to her interview on Membership and Subscription Growth! Be sure to visit MySubscriptionAddiction.com for reviews and information on the many subscription boxes available today!